Colour Print Comp. No 1 - 6th. October 2016. Judge: Tim Morland Subject: Open. Mono Print Comp. No. 1 - 27th. October 2016. Judge: Martin Fairers Subject: Open. PDI. Comp. No. 1 - 27th. October 2016. Colour Print Comp. No 2 - 10th. November 2016. Judge: David Smith. Subject: Wrecks & Ruins. PDI. Comp. No. 2 - 24th. November 2016. Mono Print Comp. No 2 - 24th. November 2016. Colour Print Comp. No 3 - 19th. January 2017. Judge: Ian Brash. Subject: Open. PDI. Comp. No. 3 – 2nd. February 2017. Mono Print Comp. No 3 - 2nd. February 2017. Colour Print Comp. No 4 – 2nd. March 2017. Mono Print Comp. No 4 – 23rd. March 2017. PDI. Comp. No 4 – 23rd. March 2017. Colour Print Comp. No 5 – 6th. April 2017. Reg Mullard’s Nature Competition – 27th. April 2017. In this competition the judge has to choose a winner out of both formats. PDI. Comp. No 5 – 11th. May 2017. Mono Print Comp. No 5 – 11th. May 2017. Unable to make the meeting so prints were not entered. Best Image of the Year Final – 25th. May 2017. Held for one day in the Cranleigh Village Hall, this year on 1st. April 2017. Member are invited to submit images and all of this are hung or projected. The images are allocated in sections and awards are given to each of these sections. The judge for this year was: Darren Pullman. The images I submitted, together with any awards are listed below. Some of the submissions are not included in the gallery so I have added their thumbnails at the end. Section 1. Monochrome Prints – Open. These Boots are made for “Working”. Section 2. Monochrome Prints – Landscape. Section 3. Colour Prints - Open. Black Rock Cottage – Glen Coe. Section 4. Colour Prints – Landscape. Tree – Wensleydale. Highly Commended. Section 5. Colour Prints – Nature. Gannets – The New Arrival. 2nd. Place. Red Deer Stag in the Rain. Section 6. Prints – Digital Art. Section 7. PDIs – Open. Derelict Snow Fencing – Dent. Section 8. PDIs – Landscape. Loch Ba – Rannoch Moor. 3rd. Place. Section 9. PDIs – Nature. 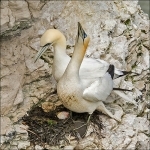 Gannet – For the Nest. 1st. Place. Section 10. PDIs – Digital Art. The Dawn of Education. 1st. Place. Section 11. PDIs – Panel. G. I. Jive. 2nd. Place. All images on this page are © Cranleigh Camera Club 2016 - 2017 2019.